We are inching briskly towards the Election Day on 11th. The Campaign will end 48 hours before the Polling i.e, on April 9th. All the contesting candidates are toiling in the harsh sun to please the voters. The last few days campaign will always have a bearing effect on the Voters and hence these days are often considered very crucial. Chief Minister Chandrababu Naidu is addressing almost half a dozen meetings or rallies every day. Jagan, however, is conspicuously disappearing from the campaign all of sudden and is positioning himself in his Lotus Pond Residence. Jagan has been missing from the campaign on Tuesday. Interestingly, this is the second time Jagan has confined himself to Lotus Pond Residence in the last week or so. Almost all the senior leaders are busy in the districts campaigning for the party and one would wonder what Jagan is doing in Hyderabad. There were conspiracy theories about Jagan planning something for the last days. He is avoiding Andhra Pradesh intentionally to prevent any intercepts by the Intelligence Departments. Is Jagan meeting someone from Telangana in Lotus Pond? What is that he wants to plan by sitting in Hyderabad? Is he getting any ideas from the Big Bosses of Telangana? These are the common questions in the minds of TDP Leaders. 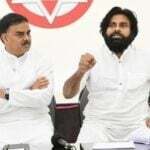 Next articleగుడివాడలో కొడాలి… దేవినేని… మాటకు మాట..